It adds a sweet touch to your favorite foods, but the benefits of honey extend way beyond taste. One the most of important benefits of honey lies in its antioxidants. Of all the natural home remedies your parents or grandparents made you try as kid—whether it was aloe vera or oatmeal or ginger—our guess is that honey was your favorite. Well, it turns out that it’s also a favorite of doctors due to its nourishing and healing properties. But what are the benefits of honey? First, a little history: the earliest record of beekeeping dates to 2,400 B.C. near Cairo, according to the British Honey Importers and Packers Association. Ancient Egyptians used honey as a sweetener, a healing medicine, and embalming fluid, and once Christianity was established, honey and beeswax became widely used for candle making. Although we have more advanced methods of embalming bodies, we still use honey today as a sweetener as well as an ingredient in beauty products, candles, and fragrances. But, most important, we use it as natural source of nutrition. According to the USDA, one tablespoon of honey contains 64 calories, 0.06 grams of protein, 17.25 grams of sugar, 17.3 grams of carbohydrates, one milligram of calcium, and 0.09 milligrams of iron. Looking at honey’s nutritional content—it contains almost no protein, vitamins, or nutrients—might have you wondering how it would benefit anyone. But it’s what honey does have that will make you want to keep it in stock. #1. Honey is filled with antioxidants. One the most of important benefits of honey lies in its antioxidants. 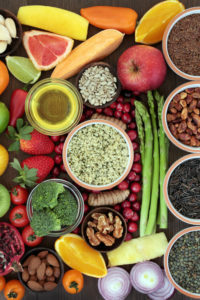 They include phenols and flavonoids, which can reduce oxidative stress and inflammation in your body while protecting you against stroke, heart disease, and cancer. Buckwheat honey, according to a study published in the Journal of Agricultural and Food Chemistry, has specifically been shown to increase the capacity of serum antioxidants in humans by 7 percent. How to use: You’d have to consume at least one teaspoon of honey a day to get an adequate source of antioxidants, but don’t forget that honey is considered an “added sugar.” The American Heart Association recommends limiting “added sugar” to six teaspoons or less each day, which equals about one-and-a-half tablespoons of honey per day. For more on the healing abilities of honey, see The Old Farmer’s Almanac post Honey Health Benefits. #2. Honey’s healthy for your heart. We’ve already mentioned that honey is antioxidant-rich, which can protect you from heart disease, but it also can also improve your cholesterol levels. According to a recent study, honey caused a 5.8 percent reduction in LDL (“bad cholesterol”) and a 3.3 percent increase in HDL (“good”) cholesterol in patients when compared to sugar. #3. It can help heal burns, wounds, and other skin conditions. In addition to being rich in antioxidants, honey also has antibacterial and antiseptic qualities that accelerate wound and burn healing by providing a moist environment and increasing the flow of nutrients to the affected site. Honey’s also effective at killing pathogens such as E. coli and methicillin-resistant Staphylococcus aureus (MRSA), which can both cause skin infections. 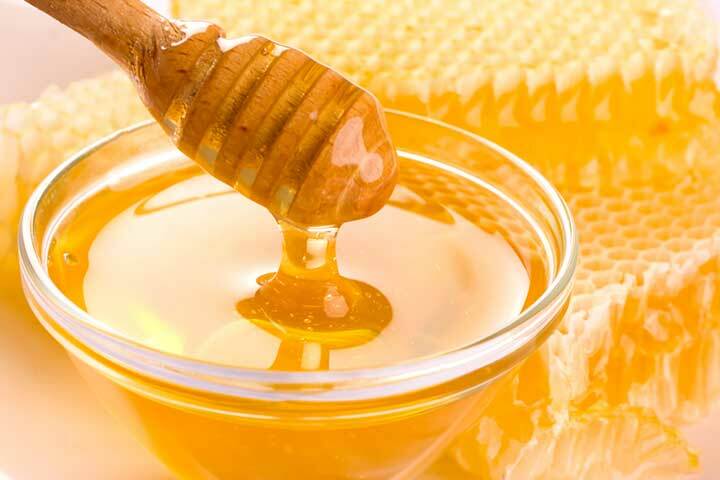 Honey can also be used to treat and prevent acne, dandruff, and itchy skin. How to use: Apply a thick layer of medicinal or raw honey on the affected area and wrap with appropriate dressing if necessary. If your wound is severe, consult your doctor before applying the honey. Look for natural creams, lotions, and shampoos that contain honey to curb dandruff and itchy skin, and to treat acne, add a couple of teaspoons of honey to your favorite homemade face mask or scrub. Click here for some ideas. Wondering where the “best” honey comes from? It’s a subjective question, as Countryside Daily explains in a post called Judging the Best Honey in the World. #4. Honey can curb your cough. How to use: Consume one teaspoon of honey every few hours to curb your cough. You can also mix it into a warm beverage, preferably fresh ginger tea, which is also good at curbing coughs and soothing sore throats. #5. It can boost athletic performance. Multiple studies conducted at the University of Memphis Exercise and Sport Nutrition Laboratory found that honey allowed 39 weight-trained athletes to sustain their blood sugar levels for over two hours following exercise. Honey also significantly increased the power and speed of nine competitive cyclists when compared to glucose and placebos. “We wanted to see if honey would be a good source of carbohydrate for athletes in comparison to other forms of carbohydrate. Honey did as well or better in several areas,” stated Dr. Richard Kreider, who led the studies. How to use: Try this homemade electrolyte drink made with honey, citrus juice, water, and salt during tough workout sessions. #6. Honey can ease digestive problems. According to research published in the Indian Journal of Medical Research, the antioxidants in honey may prevent free radicals from damaging the cells that line the digestive tract, which can cause acid reflux. Honey may also be able to reduce inflammation in the esophagus and provide a coating for its mucous membrane. Many cultures also swear by honey as a cure for diarrhea. There is some evidence that honey can reduce bacterial diarrhea in children, but honey is also high in FODMAPs and, therefore, can possibly make symptoms worse for irritable bowel syndrome sufferers. How to use: To calm heartburn caused by acid reflux, eat one teaspoon of honey or mix it into a glass of warm water. Four tablespoons of honey should be mixed into a cup of hot water to relieve symptoms of diarrhea in adults, according to ReadersDigest.com. Honey, however, should not be given to children under the age of 1. #7. It’s healthier for diabetics than sugar—sort of. Here’s the good news: Studies show that honey can improve heart disease risk factors in diabetics and it doesn’t raise your blood sugar as quickly as refined sugar can. The bad news is that it’s still not considered to be “diabetic friendly” because of its carb content, so it should be consumed with caution. How to use: If you have diabetes, it’s important to consult your doctor before making any changes to your diet. acid reflux, acne, add, aloe vera, anti inflammatory, antimicrobial, antioxidant, antioxidants, bad cholesterol, benefits of honey, blood sugar, blood sugar levels, bowel syndrome, calcium, calories, cancer, children, cholesterol, cholesterol levels, common cold, cough remedies, dates, diabetes, diabetic, diabetics, diarrhea, diet, digestive, digestive problems, digestive tract, e coli, exercise, food, free radicals, ginger, glucose, good cholesterol, hdl, health, heart disease, heart disease risk, heart disease risk factors, heartburn, home remedies, honey, inflammation, iron, irritable bowel, irritable bowel syndrome, itchy skin, ldl, mrsa, natural cough remedies, nutrients, nutrition, oxidative stress, protein, reduce inflammation, reflux, skin, sleep, sore throats, stress, stroke, studies show, sugar, sugar levels, vitamins, wound healing. Pasteurized honey has no nutrients, no health benefits. The pasteurization process has destroyed all beneficial properties in the honey. RAW HONEY HAS IT ALL. VERY HEALTHFUL! Magnesium helps me to sleep better and to Go # 2 better. I take s calcium, magnesium and zinc tablet (all in one tablet) only as needed. Honey has many benefits on our life. Honey worked great healing leg ulcer for me. Like all other parts of the human body, hair also suffers a great impact from diet, activities, nutritional content … Hair has healthy development or not, depending on the hair is available Provide enough vitamins and minerals.